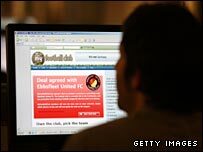 Members of fans' website MyFootballClub will formally complete the takeover of Blue Square Premier side Ebbsfleet United on Tuesday. In January more than 18,000 members voted on the £635,000 takeover, with 95.8% backing the Kent club's purchase. The deal is believed to represent the first website-community takeover of a football club or business in the world. Members will be able to vote on team selection, player transfers as well as other decisions affecting the club. MyFootballClub has more than 28,000 members, spread over 80 countries. In November, MyFootballClub announced it had reached agreement with Ebbsfleet - known as Gravesend & Northfleet until last summer - to buy control of the club. Each of its members have paid £35 to provide a £700,000 takeover pot and, after the majority backed the move to acquire a 75% controlling stake, they will all own an equal share in the club. The first Internet team selection is scheduled to take place in March. Last week Ebbsfleet announced sportswear manufacturer Nike will manufacture home and away strips from next season after 91.26% of the 13,809 members voted to accept their offer to supply kit and merchandise. "It's a wonderful opportunity for the club," said Brian Kilcullen, who will take over as interim chairman from club chairman Jason Botley. "It's been great to see Ebbsfleet fans and new supporters from around the world coming together, both at Stonebridge Road and online." 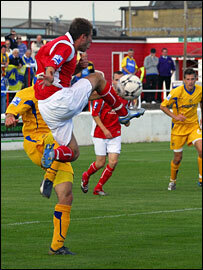 They are ninth in the Blue Square Premier, eight points off a play-off place for entry to the Football League. The Financial Services Authority has approved the setting up of the MyFootballClub Trust to safeguard members' interests in the eventuality of the club running into financial difficulties.